Format: DVD from Rockford Public Library on laptop. Sometimes, a filmmaker takes an odd turn in his or her career. Wes Craven made Music of the Heart, after all, and Clint Eastwood made The Bridges of Madison County. Those have more in common than being different from their directors’ respective normal genres. Both of them feature an Oscar-nominated performance from Meryl Streep. Given just how many times Streep has been nominated, though, that’s something that apparently can be said of a definable percentage of films. This is an unusual film in a lot of respects. Clint Eastwood has demonstrated that he is a capable director over and over again. While some of his films are not the macho cop dramas or westerns that one might think based on his filmography, a lot of his movies have a violent element to them and many play on that end of the moral scale. Mystic River, for instance, isn’t a film that has a lot of happy or satisfying endings for anyone involved. With The Bridges of Madison County, though, we’re in very new territory. This is a straight romance without a great deal else around it. It’s slow and almost meditative, even peaceful. I don’t want to imply that Eastwood’s skill set doesn’t include movies on the softer edge thematically, but his romantic moments don’t tend to be the main focus of his films. Anyway, we’re heading off to Madison County, Iowa, located just southwest of Des Moines. I should come clean on this: I know the area, kind of. I have a lot of family in Iowa, and I’ve spent a great deal of time in Des Moines. Apparently, Madison County is just southwest of the capital, evidently adjacent to Polk County. So, brother and sister Michael (Victor Slezak) and Carolyn Johnson (Annie Corley) have returned to the old family farm on the death of their mother, Francesca (Meryl Streep). What they learn is that their mother, a transplanted Italian who came to the U.S. as a war bride married to their father (Jim Haynie), had a four-day, torrid affair with a man named Robert Kincaid (Clint Eastwood), a photographer for National Geographic who had come to the area to photograph the county’s famous and picturesque covered bridges. As they explore their mother’s journals that tell of the brief but intense affair, they being to deal with their own marital problems and start to understand their mother for the first time perhaps in their lives. And that’s it. Really. 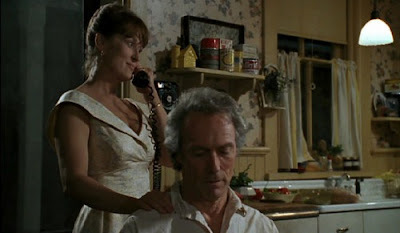 The Bridges of Madison County runs 134 minutes, and aside from the very short moments that take place in the film’s present, the entire thing is about a four-day affair of which only a day or two were anything beyond a sudden and fierce attraction. The opening gives us Francesca’s adult children and the initial attraction back in the 1960s. The middle act consists of the affair itself. The third act, while it does contain some resolution and the acceptance of our modern characters for their mother’s past, is mostly about Francesca deciding whether or not to stay in the life she had or pitch everything and follow Robert around the world. This is a film that, as can e said with a lot of what I’ll be watching in the next few months, is one that I have specifically avoided. It’s simply not a story I want to watch that often. I can’t saw that it’s not well handled, though. Meryl Streep is, well, Meryl Streep. There’s not much for her to do here, though, aside from put on yet another accent and frequently look wistful. Look, I like Meryl Streep. I think it’s probably impossible to be really serious about film over the last four decades or so and not at least be impressed by her track record, but this is another film where she’s not given a great deal to do. This is, as the title of this review suggests, nothing more than Out of Africa except about a woman who didn’t become a famous writer. Everything else seems to be about the same, though—even the Harlequin Romance-like job of her lover recalls Streep’s earlier film. Clint Eastwood is, well, Clint Eastwood. He directs this film well, and he’s an interesting choice for a romantic lead. Eastwood has the sort of gravitas that will make you believe that he might well be a noted photographer capable of heading into rough country to snap pictures of rare animals. But, like Streep, there’s not a great deal for him to do. There’s a sort of courtship, a consummation, and the realization that, if the affair is known to anyone, it will ruin Francesca’s life and probably the lives of the rest of her family. All Eastwood really needs to do is be more or less vaguely rugged and sexually available. That he could probably pass for mid-50s instead of the 65 he was helps here. For as little as happens in this movie, I found it to be rather nice. It’s calm and sort of beautiful. “Meditative” is probably a better word for it. It’s not the sort of film I’m likely to pull up frequently, and yet there is a beauty here, a sort of cinematic stillness that is easy to find attractive. I’m not sure that Meryl Streep does enough here beyond having (yet again) a convincing accent. At the same time, this is a movie that perhaps deserved a bit more acclaim in other areas than it got. Sometimes, calm and sedate and tragically sweet is enough. I think this is one of those times. Why to watch The Bridges of Madison County: It surprisingly tender. Why not to watch: Not much happens. Why not to watch this film adaption of Robert James Waller's best-selling novel: the two sequels were never filmed, yet somehow a Tony Award-winning musical was. I don't mean to be a Philistine, but was there a call for the sequels? And how would you market them? Yes, there was a call to film a sequel, but how do you get two megastars of their advanced ages to do a sequel of the same characters? So, "A Thousand Country Roads" was written years after the film to appease fans who greatly desired to know what became of Robert Kincaid and Francesca Johnson. And the third book focused on Kincaid's illegitimate son and his travels. Marketing would not have been hard had the same actors agreed to star in the sequel as it already was a known commodity. However, even known commodities can start to go stale as seen by the recent backlash against the new Star Wars film, "Solo," by many hard-core Star Wars fans. Hell, I'm a mega fan, but even I have had enough and have yet to see the current Star Wars film still in theaters. Yeah, I get what you're saying. It's just not the sort of movie that typically demands a sequel. Then again, the Linklater Before trilogy certainly demonstrates that it's a possibility. I was just having a little fun with the idea. I'm not sure that I'd really want a sequel--I like where the story ends for the two of them. More would feel unnecessary, or perhaps like fan service.